We try really hard (OK, not that hard) to hide our love of whisky and any possible influences it might have had in the naming of our company. But there is one night of the year when we don't even pretend. January 25th is Burns Night (shouldn't that be "Burn's night"? Apparently not, according to the BBC). The supper to celebrate Robert Burns, eat haggis and drink whisky competes with the best national holidays around the world including Tomatina and the Superbowl (and since I'm now part-Scottish by marriage, I figure I can claim it as my own). 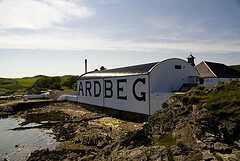 To celebrate Burns Night, not only will we be raising a glass, we will also be giving away a bottle of Ardbeg, one of the finest whiskies in the world (you can also follow them on Twitter). Update: Jura have contributed a bottle of their whisky as well, so now there's twice the reason to enter! Read more about Jura on their website, or say thank you by following the Jura Twitter account or entering their own Jura competition on Facebook. Update 2: Well, this is super-cool, those nice folk at Master of Malt have also chipped in with a spectacular addition - a Single cask 19 year old Tomatin (cask strength). You can thank them by following them on Twitter or, you know, buying some whisky from them. In order to tenuously link it to our company, we are also throwing in a Distilled hoodie. Limited edition (hardly anyone outside the company has one at the moment), they are super-cool, quality hoodies in dark grey with the Distilled logo and web address on them. 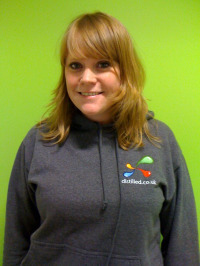 Thank you to Lucy Watson from our web dev team for modelling the hoodie against our bright green wall. All you have to do to enter is follow @distilled on Twitter or tweet @distilled with the hash-tag #distilledwhisky. We will be judging the winner randomly from the entrants early afternoon tomorrow GMT (26th January). Incidentally, if you are into whisky, I recommend checking out Connsr - the whisky social network. Here's me on there: willcritchlow. "Yes, I'd like to win a whisky from @distilled #distilledwhisky. Happy Burns Night."